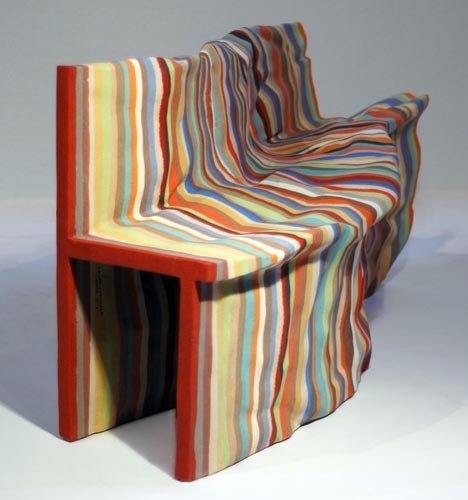 How would you like to melt into this seat, or sit in this melted seat? Our cool stuff item comes from Julien Carretero. It is not only a spectacular ‘melted seat’, Carretero calls his creation, To Be Continued. This creation obviously does not stop here. 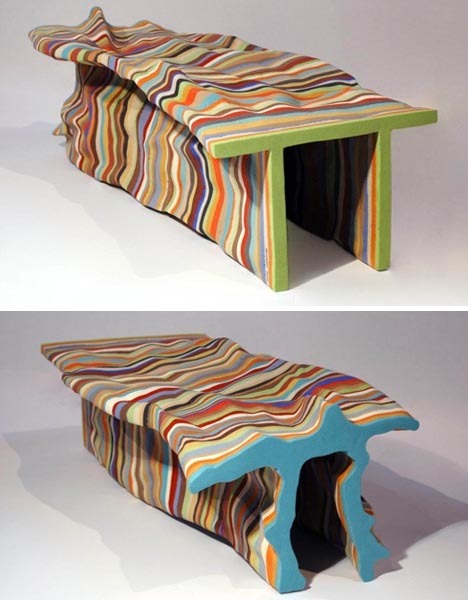 “Each piece produced comes as a result of a process applied on the piece that came before. Each piece is then existing because of the others and couldn’t have been designed without the others,” said Carretero. And the whole purpose of making such a thing is to experiment with creating a real and recognizable uniqueness within serial production. If you are concerned about the ‘messed up’ look, the artist says it is because of the imperfection of the cast, that the object slowly mutates and starts designing itself. I am not going to argue with that. I think they look pretty cool; my only concern or curiosity is how does it feel to sit on the seats? The multi-disciplinary industrial designer was born in Paris suburbs. Carretero studied industrial design consecutively in France and in England before attending the Contextual Design MA at the Design Academy Eindhoven. 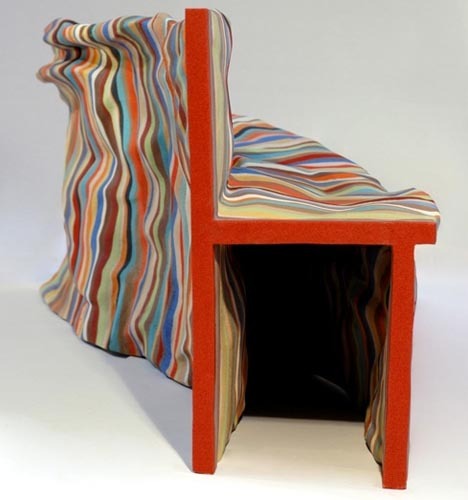 In conjunction with his training and studies in the Netherlands, Julien worked for two years at designer Maarten Baas. After his graduation in 2007 he founded Studio Julien Carretero, which moved to Brussels in 2012. He has held and participated in several major exhibitions across Europe. Click on the link below to see the To Be Continued process itself. When an artist and a poet come together, even by coincidence, this is what happens – something cool. 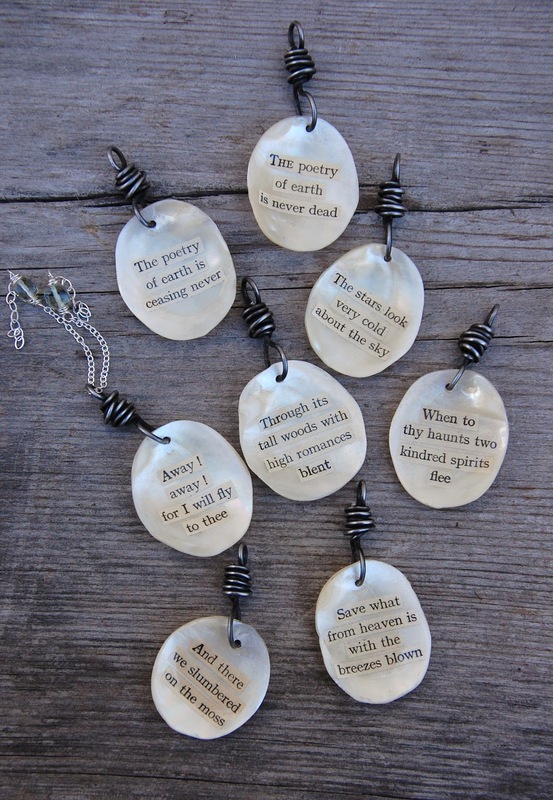 These poetic pendants were made by Cynthia Murray and she placed into the concave of each shell. selected verses from 1920’s book of poetry by John Keats. The shells were a gift from Cynthia’s mother (as a handbag) that she never used. When the idea finally came, she took the shells off the handbag and turned them into single poetic pendants. 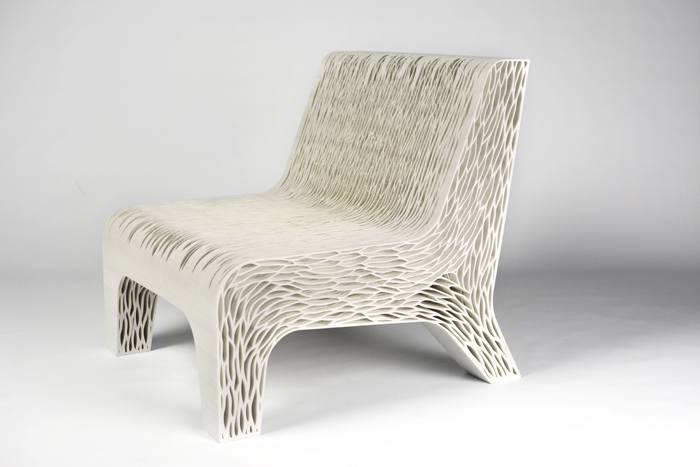 Artist and industrial designer Lilian van Daal makes exquisite things from various materials. Her collection made cool stuff this time. 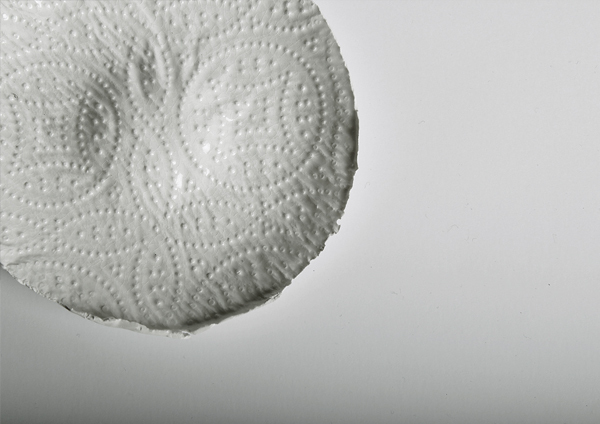 Here, she pays tribute to paper by showing it in ‘delicate textures’ to remind us of how we give little value to paper when we use it, perhaps sometimes irrationally in our every day lives. 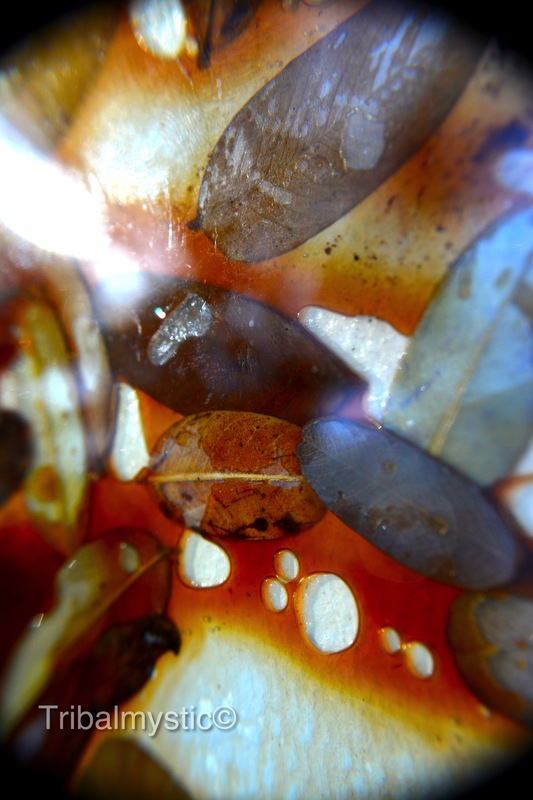 Lilian says: ‘Delicate Textures’ she hopes, would make us think about the everyday use of products and materials. 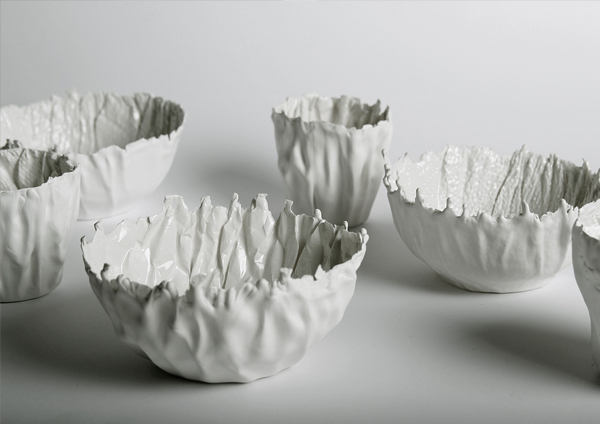 In this collection paper is immortalized in an exclusive porcelain object. It is a tribute to paper and its origin. It makes us aware of the self-evident use of paper, since it appears and disappears again and again in our daily lives. Here are some of Lillian’s other fascinating creations. 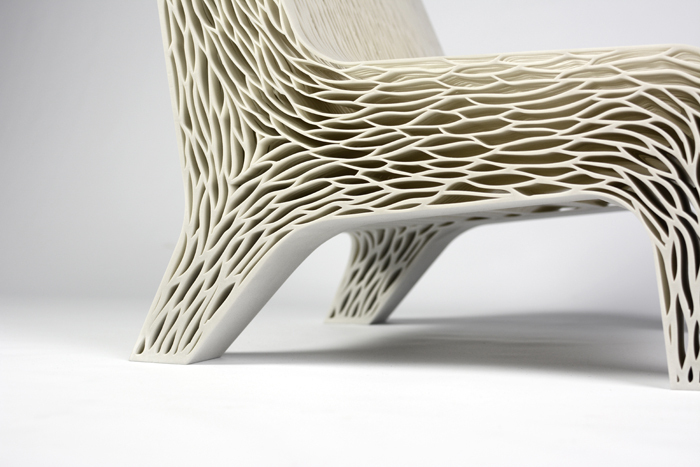 A 3D printed soft seat. Besides her own work, she has worked for Studio Drift, Feiz Design and Bleijh Concept & Design. She started in 2010 with working as junior designer at StudioMOM, where she still works. This sculpture in a library in Prague was designed by Slovakian artist Matej Kren. 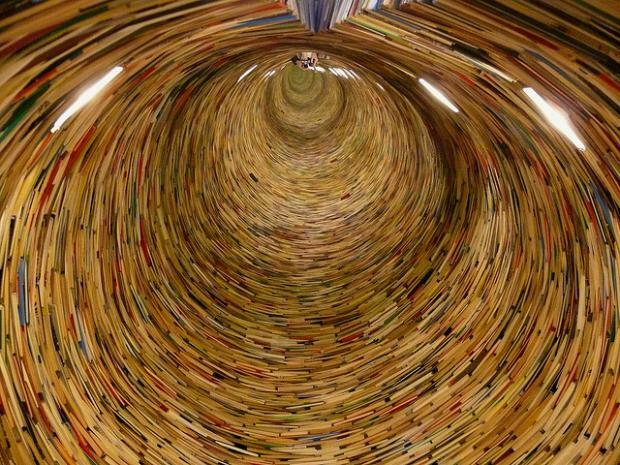 There’s a mirror inside so the tunnel of books looks endless when you lean into it. I have not posted any Cool Stuff for a while so I thought, as a treat, I found a collection of sculptures made from books to share with you. There aren’t too many details available at the time of the search, but I have this link to the rest of the 13 book sculptures. Enjoy! 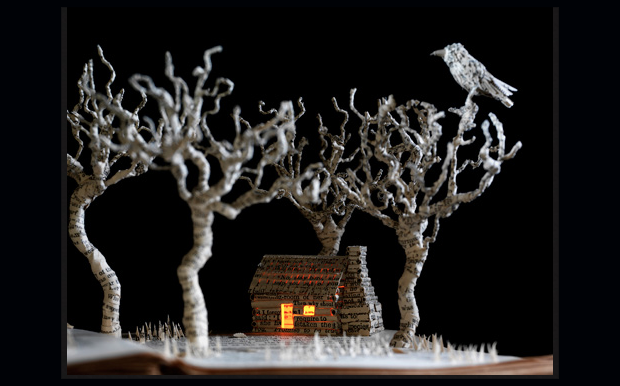 Paper sculptor Su Blackwell makes delicate cut-outs that appear to be rising from the center of the book. 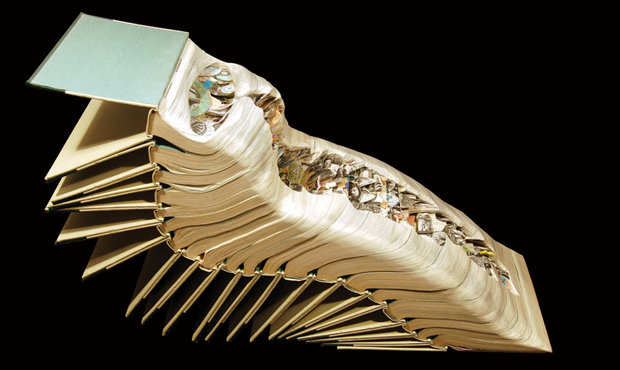 This sculptor carves angular pathways into books, making convoluted three-dimensional figures worthy of M.C. Escher. Click or search for Cool Stuff on this blog to see many other cool things. 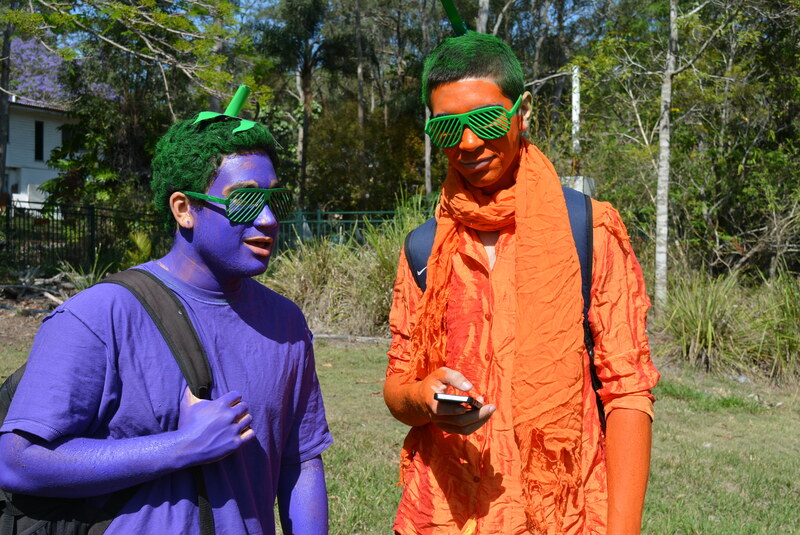 Chris the carrot (left) and Ethan the eggplant. The carrot and the egg-plant showed up at our house today. In actual fact, the carrot slept in our house and the eggplant came to meet his fellow ‘vege’. 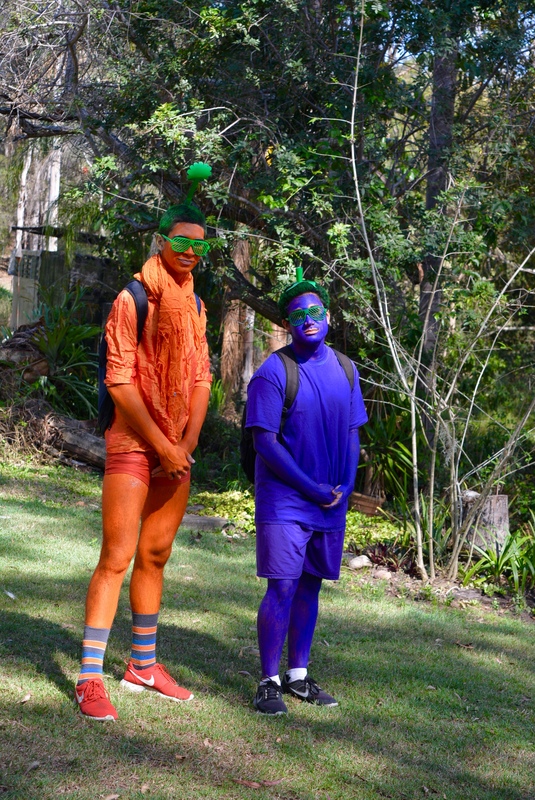 These two ‘vegetables’ were preparing for the Year 12 free dress day at Kenmore High School, Brisbane. My son Chris and his friend Ethan have almost reached the end of high school. The dress-up is the beginning of the ending. These two had to dress as a vegetable that shared the first letter in their names. That’s why the boys used the letters “c” and “e”. Now, who could have thought of such a thing? Watching them from the window as they were painting their limbs, I thought they were heading in the right direction – they had the right colours. After an hour, I came down to photograph the boys and started to laugh. Instead of two vegetables, two aliens were peaking back at me behind large bug eyes. “You don’t look like vegetables, at least not the real vegetables – perhaps the futuristic vegetables,” I said. They were not impressed with my jokes. …………………………………………………. Next post – 150 word story. 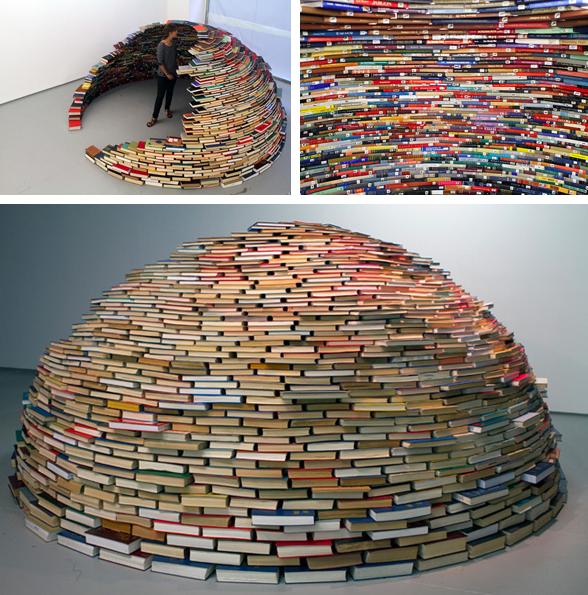 A book igloo by Colombian artist Miler Lago was constructed cleverly with their titles/spines face inside. The entire art is created by material of the printed words. Miler was born in 1973 and lives and works in Bogota, Colombia. 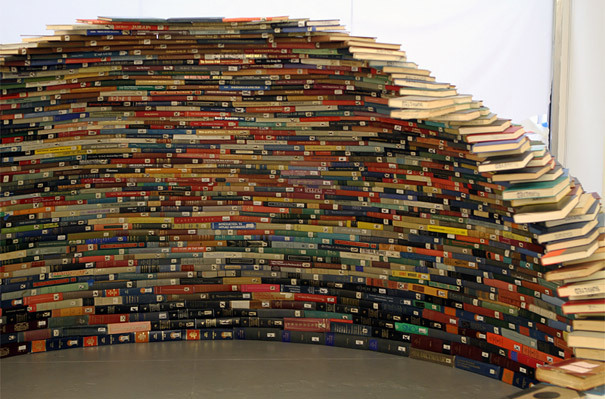 He is known for his other famous work, Fragments of Time – an attempt on the artist’s part to slow things down, but the form of the work itself goes further still: these are branch-like forms composed entirely of sheets of newspaper and books, densely stacked together and sanded at the edges, which generates both a mottled, trunk-like surface and a wood effect colour, (see pictures below). I love the accidental artwork. That’s why I enjoy art experiments. 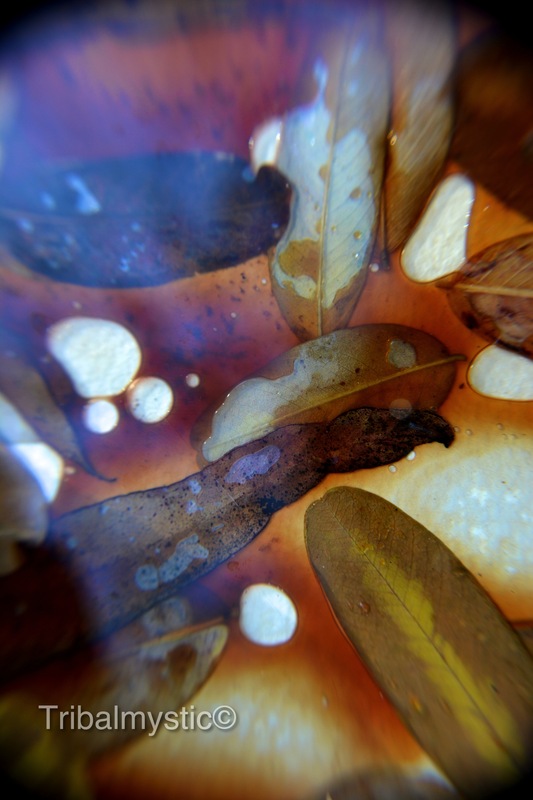 I set out to do another art experiment in my garden this morning. It was a beautiful day for it. 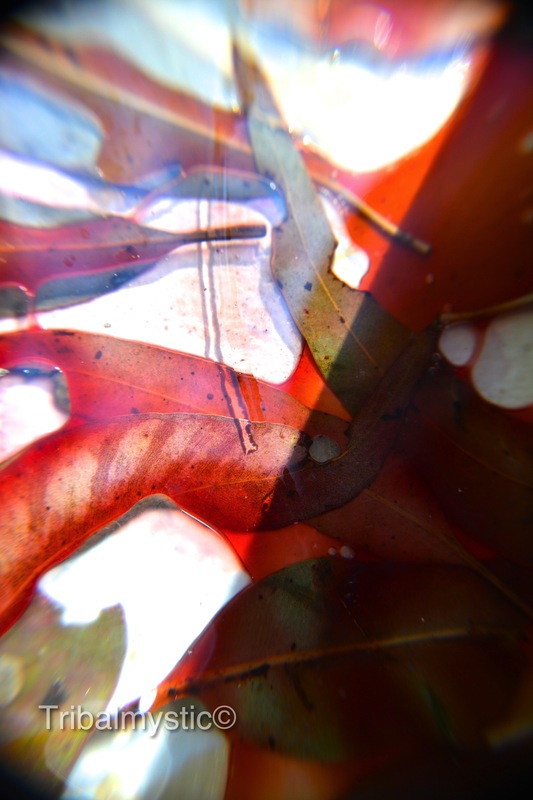 I ended up accidentally shooting the leaves intended for my experiment in another artwork, totally unplanned. The accident in the experiment looked too interesting to not photograph. After laying out the materials, I applied water and dyes. Then, I pinned everything down with glass. I noticed reflections and water bubbles sneaking into my work. They had their own colour and shadows. That was when my artwork plan changed. It was the experiment that came out of another experiment, the kind of ‘accident’, we artists love. Something you did not expect, never meant to or planned to create but it becomes yours. A gift from the universe. 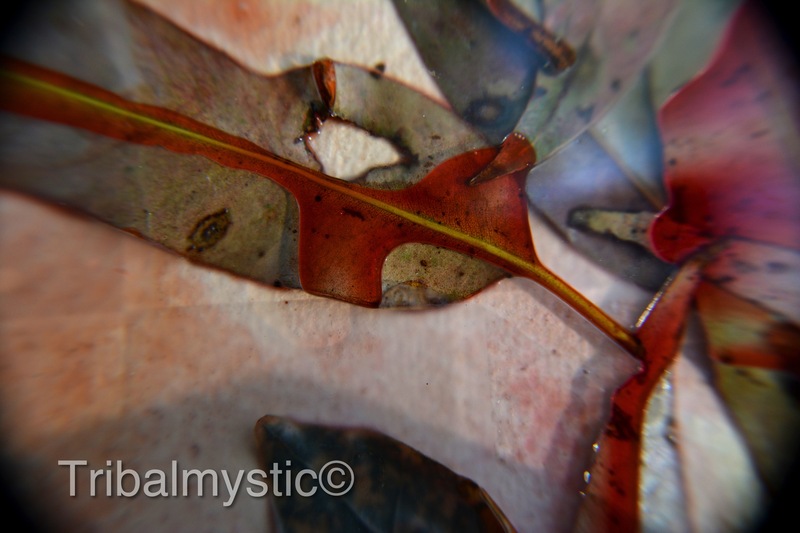 The images were shot with a Nikon D5200 using both macro and 18-55mm lenses. We shall re-visit the work, after all the water dries up in a few days. 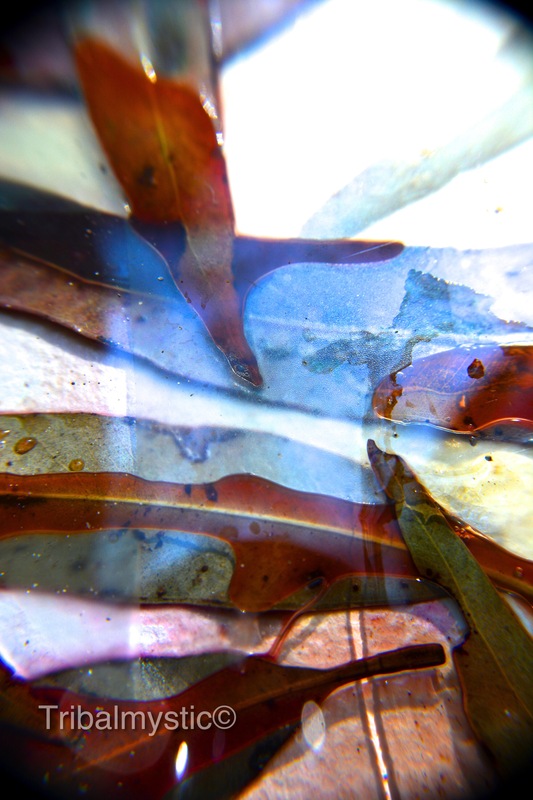 Thank you for reading about my experiments, please let me know what you think of my accidental artwork in the images. 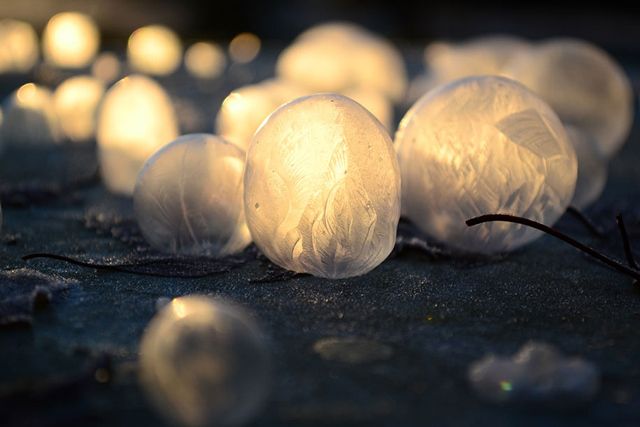 A mother takes her son outside to blow bubbles in the snow and gets inspired to produce one of the most amazing photographic series of frozen bubbles. Found on DNA Art is our cool stuff – a collection of bubble photographs by Washington-based photographer Angela Kelly. 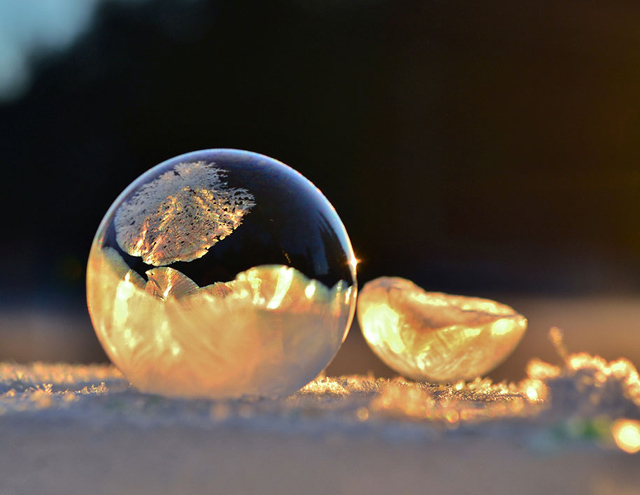 The bubbles were created using a simple solution of dish soap, karo syrup, and water blown into a minus 9 degree temperature. “We blew the bubbles across the top of our frozen patio table and also upon the hood of my car and then we watched in awe as each individual bubble froze with their own unique patterns”. Kelly said. The Serpentine Pavilion made my Cool Stuff list. What does the serpentine pavilion look like? Below is the 2014 The Serpentine Pavilion. 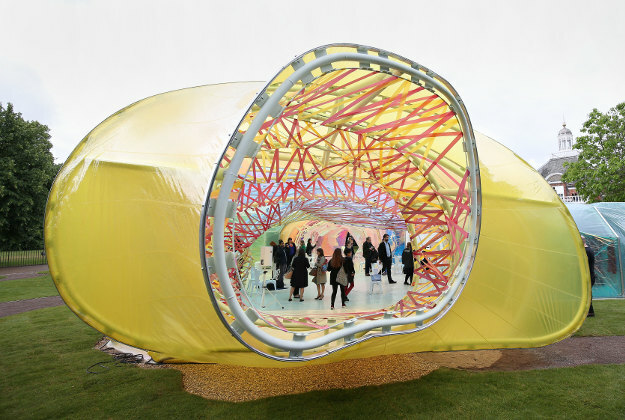 But, check out this year’s pavilion (above) which looks just like a rainbow caterpillar. Spanish creators José Selgas and Lucía Cano explained that this year’s serpentine pavilion was an experiment that plays with coloured, translucent and mirrored plastic sheets. “We want to test different materials and in this case it is EFTE (plastic)” Selgas said. 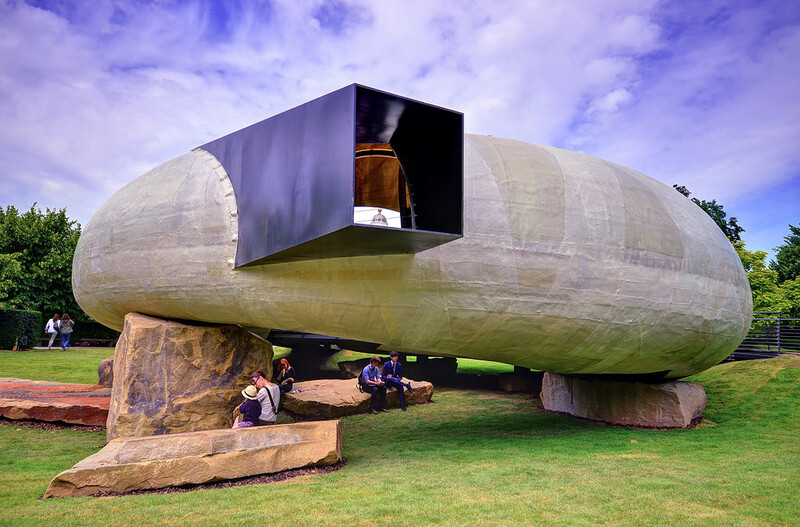 The architects want visitors to use it, walk through, sit in it and interpret the serpent – freely. 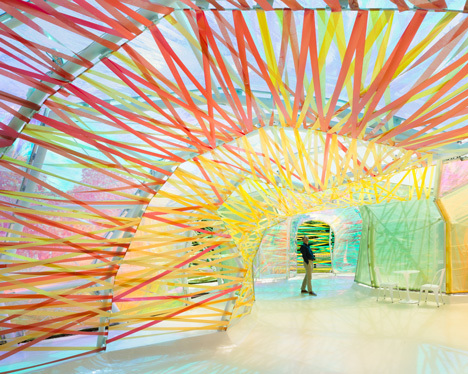 The Guardian called the 2015 serpentine pavilion London’s psychedelic maze that drew colours from summer and rainbow. Selgas Cano are never shy about experimenting with wild colours, and their summer structure for the Serpentine Pavilion is no exception. 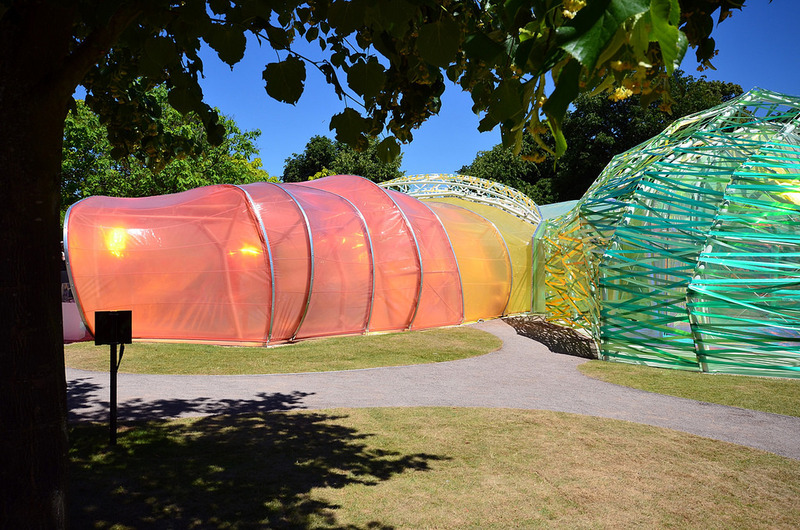 This strange rainbow cocoon looks like a childish scribble that has been enlarged, changes colour as you wander through it – and is a perfect party pavilion for the annual Serpentine commission’s 15th birthday. The Serpentine 2015 Picture by George Rex. Those interested and if you are in London – you can step into London’s psychedelic new maze now. If you are not able to see it, click on the link below to watch the video.